How to tie the full blood knot for joining mono to mono. This is one of the most used fishing knots. 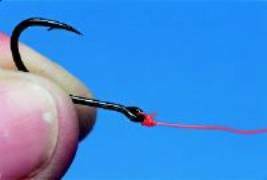 It is used to tie mono of the same or different diamters together so is a good knot for tying off droppers or for creating tapered leaders, or for extending backing mono. It had a high knot strength and is also the knot to use to repair accidental breaks in mono mid session. Make at least five turns each side, and always dampen the knot with saliva before tightening, as with all knots. If the knot has to be cast through rod rings, leave the tag ends at least an inch long. The line coming from the left (red) is threaded at least three times over and under the line coming from the right (green). After threading, place the end of the line (red) up through the gap between the two pieces of line. Now do the same with the line coming from the right hand side (green), but this time threading the line down through the gap between the lines. Pull the longest parts of each piece of line in opposite directions and the knot should start to slip together. Wet the knot and then continue to pull the lines apart so that the knot appears neat with each coil of line nestling snug against each other. Now trim off the short pieces of line. Standard eyed hook and swivel knot. This knot is widely used for tying line to hooks or swivels and is the first knot many anglers learn. It’s a safer version of the standard blood knot because of the tag of line that is tucked for extra security. It’s a good mono line knot for eyed hooks of size 16 and bigger. For small hooks like 18s and smaller you are really much better using a spade end than an eyed hook. They give you better presentation. Don’t use this knot with braid because this is a form of strangulation knot which could slip. Twist the mainline and tag end together like this at least eight times. Take the tag end and thread it back through the bottom loop by the eye of the hook. Bring the tag end back and take it through the line at the head of the knot, to form knot. Moisten the knot and begin to tighten down very slowly making sure everything is secure. Knot for joining mono to mono. The water knot, known as the surgeon's knot in the US, is used to tie lines of equal or differing diameter together and as such can be used to tie off droppers or to create a tapering leader. Water knots are also used commonly in coarse fishing to tie lighter hooklengths onto mainline, or to attach shock leaders to mono or braid for long casting. Lay the tow lengths of line together so that the loose ends overlap by about eight inches. Form a loop by crossing the two double up lines over each other. Wrap one loose end through the loop four times as shown.